Discover 284 campsites of France with swimming-pool but also over 450 campsites throughout France, offering a variety of rental mobile homes, chalets and accommodation of more atypical as bungalows or caravans, but also leisure facilities such as aquatic areas with sometimes an indoor or well even with heated pool for your comfort, for an unforgettable vacation. Campsites in France with swimming-pool welcome you to your camping holiday 2, 3, 4 and 5 star or LRP. Campsites with recreational facilities (swimming pool, water park, water park, water slides, wading pool, spa, playground, tennis court, multi-sports), entertainment and services (restaurant, bar, food, WiFi access, disabled access, camper services) to make the best of holidays throughout France with swimming-pool. 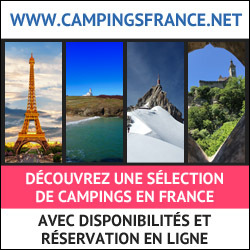 Traditional camping in France with swimming-pool on pitches or rental of mobile home camping, campsites below offer the best camping in France with swimming-pool. Enjoy the outdoor accommodation and campsites in France with swimming-pool! Rental of mobile homes, chalets, bungalows, cottages, Bengali, cottages, trailers, caravans, tipis and camping sites equipped for your holidays in France with swimming-pool, our French campgrounds welcome you everywhere in France with swimming-pool, a favorite camping in Europe. Have a great holiday camping with our campsites in France with swimming-pool! In Picardy in the coastal hinterland, 10 minutes from the beaches with their fine sand, the Val d’Authie is waiting to give you a quality stay, near the bay of Somme Enjoy the sport and leisure facilities thought out for all the family. Relax on the large camp lots designed carefully for a 7-hectare landscaped park offering you an incomparable space for your holidays. 2 star campsite in Puy de Dôme in Auvergne. Marie-Pascale and Guy are pleased to welcome you at Camping Du Colombier, located in Loubeyrat in the heart of the Volcanoes, 12 km from Volvic and 30 km from Puy de Dome and Vulcania. The campsite offers different types of rental accommodation: cottage, bungalow or mobile home for 4 to 6 people, and has a semi-covered outdoor pool. The campsite allows disabled access with sanitary adapted. Free Wifi available. Many facilities are at your disposal. We propose you, in our new building of reception, the possibility to restore you to the snack at night from 18 hours. You will also be able to take away on your site fries, burger ...Various activities on site or nearby and pets are allowed. See you soon on the land of volcanoes. Establishment recommended for the GTMC VTT and Motorcycle Circuit Combrailles. Camping 3 étoiles en Bretagne, à Saint-Brieuc, en côtes d'Armor. A moins de 1 Km de la gare SNCF (TGV)en centre ville. Accès possible à la plage par navette à 9 kms.Le camping propose diverses locations de mobile-homes à l'année, des emplacements nus pour camping-car et caravanes. Mais aussi des chalets, des tentes équipées. Vous trouverez sur place, aire de jeux pour enfants, terrain multi-sports,trampoline,animations en juillet/août, soirées animées et club enfants.Services sur place : restaurant, snack, bar, Accès direct au centre aqualudique 'Aquabaie'(10 entrées offertes/semaine) en location en juillet/août et à la station location vvt. Aux portes d'une immense Baie longée de falaises, de criques, de dunes et de plus de 15 plages. C'est le point de départ idéal vers le sentier des douaniers (GR34) qui vous guide vers l'insolite Côte de de granit rose, Paimpol, Cap Fréhel ou Dinan. Partout vous découvrirez ses trésors, dont le plus fameux, la coquille Saint-Jacques. The campsite LE GRAND LARGE à Les Pieux, arranged on a slightly sloping sandy beach facing the Channel Islands, offers the charm of the Cotentin on tranquil grounds. Just 20 minutes from Cherbourg, you will enjoy travelling through the pretty countryside of Normandy, stopping occasionally to admire the scenery overlooking the bay, or visiting the Cité de la Mer. Or why not take a day’s trip to the Islands of Jersey or Guernsey? Your holiday at a 3 star campsite in Finistère Sud, on the Crozon peninsula, in Brittany. Our campsite LES BRUYERES is ideally located 15 minutes walk from the beach of Morgat and its shops, and close to the hiking trails (GR34). You will be able to discover one of the jewels of the Crozon peninsula, the virgin island, a paradisiacal cove and very coveted by nature lovers... The Corsicans would almost envy him! Our campsite Finistère Sud 3 stars welcomes you in a natural setting. The campsite proposes you to rent a mobile-home or a traditional pitch, but also to take advantage of its covered and heated swimming pool. Those who are passionate about nature and the sea will be delighted to follow the GR34 (customs trail), a famous route in Brittany. 4 star campsite in Indre et Loire with indoor swimming pool near Tours in the heart of the Loire Valley. 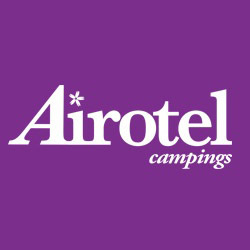 Welcome to camping Airotel La MIGNARDIERE located 8 km southwest of TOURS, and ideally located for a visit to the Loire Valley and its castles. Discover Villandry and its gardens 10km from the campsite, or the cycle path "la Loire à Vélo" which passes 2km away, allowing you to take many walks from the campsite. On site, you will be able to access the swimming pools, one of which is covered and heated and a spa area to relax. You can also rent one of our fully equipped chalets or mobile homes for 4 to 6 people. Join us for a stay or holiday in the Touraine region, book online at www.mignardiere.com or by phone 02 47 73 73 31 00. Our 3-star Jura campsite near Lake Vouglans, CAMPING LA PETITE MONTAGNE, is located in Moirans en Montagne. Quiet and family campsite dedicated to relaxation, we offer an indoor heated swimming pool, as well as the rental of mobile homes and chalets. You can also choose the traditional campsite for your tent, caravan or camper for your stays, weekends or your next vacation in the Jura.